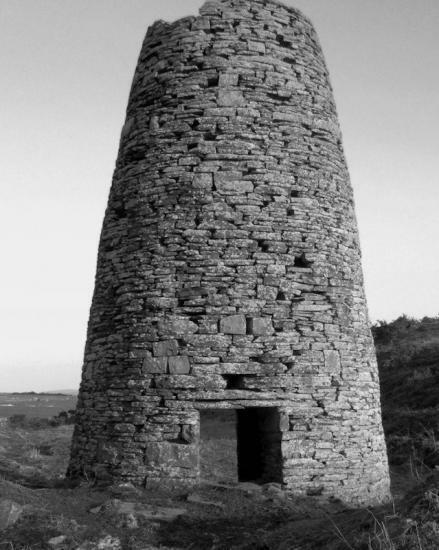 Cover picture: The windmill pump tower at Achscrabster Quarry. The year 2012 was a poor year for summer weather and that is reflected over the whole of Britain in sparse records for plants and insects in particular. However it did not seem to affect the cetaceans and the bird records were unusual rather than sparse. This issue of the Bulletin is my 14th and I am pleased to open Volume 8. As I have commented previously the numbering in the past has not been very logical but I am trying to keep it consistent with 8 parts to each volume. The authors have produced articles of high standard once again and I find it a very interesting read as I put the parts together. I hope you do too. During the coming year we hope to produce a new booklet dealing with the artefacts of recent history to be found around Caithness. Tuesday 9 April - Annual General Meeting at the Castletown Hotel - 7.30pm followed by a presentation of photographs taken on our outings. There will be a small charge for supper. Friday - Monday 26 - 29 April - The Club Weekend staying at the Nethy Bridge Hotel. Terms £42.50 pp per night - dinner, bed and breakfast - £127.50 for the weekend. We are fully booked at the moment but phone Marion (01847 892999) in case we have a cancellation , also please phone SOON if you have decided not to come! Geoff and Calum are in charge of the programme. Details later. Wednesday 8 May - A talk from Dr Havers of Edinburgh - 7.30pm at the Pentland Hotel - his subject will be "Archaeological Ground Surveying"
Sunday 26 May – The Walking Festival – Calum will lead a walk to Watenan and Cairn of Get. We leave Thurso train station 9.30am, Wick 9.45am – meet at Watenan Loch car park. Friday 21 June – An evening walk to Cnoc na Maranaich with Geoff, hopefully to see the mid summer solstice! We leave train stations Thurso and Wick 7.30pm meeting at Dunbrae croft on the Graveyard Road – Dunbeath Estate at 8.15pm. Sunday 14 July – A sail to Stroma leaving Gills Harbour 10.00am - price £15. Book with Marion (01847 892999) – this is of course weather dependent ! Sunday 29 September – A walk for Archaeology month to the pre-clearance village of Broubster. Geoff to lead. Leaving Wick train station 10.00am meeting Thurso10.30am. Sunday 20 October – Seeing deer at Langwell – Calum to lead. Leave Wick and Thurso train stations 10.15am meet at Langwell Gardens car park 11.00am. NON MEMBERS WELCOME –PLEASE WEAR SUITABLE CLOTHING AND BRING A PACKED LUNCH. WE ALL COME AT OUR OWN RISK. The year started as usual with our Coach trip. This was advertised as a motorcade as it seemed we couldn't afford a coach. However, Dunnett's coaches came to our rescue with a brand new coach – a black one as behoves undertakers and off we went to Tongue on Sunday 22 April. Our first stop was Skerray graveyard which is beautifully placed overlooking the bay to see the memorial of a Titanic victim. Quite accidentally, it was the centenary of the disaster so our visit was topical. Soon we were at the Ben Loyal Hotel for lunch. They put us in the lounge, with a big window affording us lovely views all around. It was so lovely with the reflection of the sun on the water, that some of us thought it would be good to come back again for a few days in the summer! Then to visit St Andrew's Church which was re-built in 1680 by Donald MacKay Master of Reay who included the MacKay loft lit by a window above. Donald MacKay also re-built Tongue House which was burned to the ground by General Monk during the Civil War (1660 – 69) as a reprisal for the Reay family support of the Royalist cause. Finally, we drove up the Kyle to the Broch. There we parked in a quarry – our quest – to find garnets! Our more lively members climbed up the very slippery slope to the broch with Geoff and Tony Bradford, intent on mining garnets which they did with some success. The rain came down and soggy members returned to the coach. Tony offered garnets all round but they were small and scruffy and there were not many takers! We were back in Thurso by 5.00pm. May 18 – 21 – The Club weekend – to Orkney this year staying at the Ayre Hotel Kirkwall. We used the lunch time ferry from Gills to St. Margaret's Hope then drove to Kirkwall. Not much of the day left by now so most of us settled in at the Hotel and then wandered around the town getting our bearings and deciding what we would see later if we had time. Geoff had prepared a programme for us but we didn't really stick to it. There is so much of interest to see. On Saturday most of us walked around the Ring of Brodgar stone Circle and Skara Brae and Skaill House – the home of the man who discovered Skara Brae in 1850. We were disappointed not to be allowed access to the Ness of Brodgar new "Temple" but it was not open till July. Then for a wander around Stromness with the museum and the Pier Arts Centre and there were lots of other delights on our list that we didn't manage to see. There's always another time! Sunday was another busy day. We boarded the ferry from Tingwall to Rousay then went by mini-bus to Midhowe and so to Midhowe chambered cairn – a huge impressive megalithic chambered tomb with 12 stalls protected by a modern building. Farther down on the coast there was Midhowe Broch – very well preserved with remains of later buildings around it. We returned by bus to the ferry terminal for refreshments and from here we could take the bus to Taversoe Tuick ( a two storey chambered cairn) and to Yarso. What a wonderful day out and all in lovely sunshine! Monday 21st – home today. We spent the morning in Kirkwall, then off to see Tomb of the Eagles and so to St Margaret's Hope ( a nice little Art Gallery there) and home on the 5.00pm ferry. What a great weekend and the weather could not have been better. Thursday 7 June – Geoff Leet led an evening walk to Hill of Forse. The weather to say the least was not very hospitable – damp and misty! 9 brave members drove up the farm track and turned in a soggy field. We trudged down – nearly missing the broch in the mist. It is an extensive ruin, once partially excavated and so is confusing to understand. Sunday17 June - Calum MacKenzie led a walk Armadale to Polouriscaig – This deserted village (NC764 656) lies to the North-west of Armadale from which a path some 2.5 km long runs to the village. Settled in the 1830's the last family left in 1935 and moved to Armadale. During our walk the weather was overcast with brief clearings, mainly still,dry and warm, despite this we were spared the midges! Indeed, there were very few insects though Tony Bradford did see a mating pair of Green Vein White butterflies. Most of the plants seen were of the usual acid moor type with some birdsfoot trefoil and bush vetch along the path. Elizabeth photographed a sundew which appeared to be the scarcer Drosera anglica and Diana found a blue flower growing on a ditch side which Tony identified as Heath Speedwell: Veronica officinalis. On the approach to Polouriscaig a considerable number of prostrate juniper bushes were found, more than anyone could remember on previous visits. We had lunch in one of the ruins to the south-west of the settlement which, from its position by a small burn, may have been a mill. From here Tony thought he caught a glimpse of a Dipper higher up the burn. One interpretation of the name Polouriscaig is Anchor Pool so we walked to the coast to see what that refers to. It was difficult to picture how the double inlet called Geodh Ghamhainn could provide an anchorage or a means of unloading cargo up the rocky surroundings. However, there was nowhere else more suitable in the vicinity . We walked around the ruins -one of them contained the remains of a school desk. On our return, we looked at the lifting device called a Blondan, at Armadale Harbour (Port a' Chinn) – could a similar device have been used at Polouriscaig? Five members and one visitor turned out for the walk, contrasting with the 43 people on our 1995 visit! Many thanks to Tony for much of the information used in this report. Thursday 28 June – An evening walk led by Elizabeth - Ackergill to St. Tears. Elizabeth was accompanied by 4 hardy members on a damp, misty evening. Parking at Ackergill Mains we walked past the Tower and the window from which Helen of Braemore jumped to her death to escape from Dugald, Chieftain of the Keiths, who had abducted her on the eve of her betrothal to Alexander Gunn. Crossing an elegant stile into the field we eventually reached the Duck Decoy.It has been unused for many years but in Victorian times was used for shooting wild fowl for consumption at the Tower. The Decoy is made up of a large circular wall enclosing ground and a moat crossed by several small bridges then a moat and an island in the centre connected by another bridge.Water draining from the fields feeds into the moats and out at the lower end draining through the sand dunes to the sea. And danced on the green where the chapel stood. One of the Presbyterian preachers of Wick is said to have abolished this practice and arranged a diet of catechising in the Parish on the day of Holy Innocents but no-one attended and went as usual to St. Tears chapel! The site of the Chapel was also the battle site of a feud between the Gunns and the Keiths (See the next article– Ed) . It is recorded that the feud began when Dugald, Chieftain of the Keiths, abducted Helen of Braemore, daughter of Lachlan Gunn, when he discovered that she was betrothed to Alexander Gunn. The attack occurred on the night before the wedding and Alexander was one of those slain by the Keiths. This led to Helen’s suicide who threw herself from Ackergill Tower. Subsequent conflicts between the two clans were for the most part indecisive and losses were numerous on both sides. After long quarrelling between the Keiths and the Gunns it was decided that "a battle of champions" would be fought between twelve men on horseback on either side but the Keith’s arrived with two men on each horse and massacred the twelve Gunns. By the 1970’s the feud between the clans was no longer an issue. At the urging of their clan members, the Chief of Clan , Sir James Ian Keith,Earl of Kintore and the Commander of Clan Gunn, Ian Alexander Gunn of Banniskirk signed a"Bond and Covenant of Friendship" on 28 July 1978 at the site of St. Tears on the 300th anniversary of the battle there. In 1999, the Clan Gunn Society erected a memorial at the site. We also recalled that we had retraced the footsteps of the first outing of the earlier Caithness Field Club on 17 May 1902. On that occasion forty members had driven to Ackergill Tower where they were given a conducted tour of the tower by Mrs. Duff-Dunbar. They then proceeded along the shore to the site of the historic chapel of St.Tears where the tale of the battle was related. Sunday 8 July – Geoff led a walk Ousdale Broch and Badbea. Another wet day! We first drove to the lay-by above Ousdale Broch and it was decided unanimously that the whole walk would be too soggy, so we drove back to the Badbea lay-by and walked down to the monument. We were looking at nearby long houses when we were joined by Richard Polanski! He had intended to come, but being an hour late had decided to go by Badbea and meet us on the track from Ousdale. He was surprised that we had appeared to make so much progress! By this time we were quite wet enough and we ate our sandwiches and came home. Thursday 19 July – An evening walk visiting Harpsdale Henge, Westerdale Doo’cot and Broch. We first visited the henge at Pullyhour just outside Halkirk. It comprises a flat, featureless central area 8.0m. in diameter within a silted ditch and an outer bank. There is a suggestion of a causeway through the S.W.axis. Dr Richard Bradley of Reading University gave us a talk on the excavation in Halkirk Ross Institute some years ago. So on to Dale House - we had asked permission of the owner – Mr Woolley to see the doo’cot in the grounds and he readily agreed. The doo’cot was impressive 17-18th century four stage beehive doo’cot with a wide circular apex entrance for birds lined with 350 nesting stone boxes situated within a circular walled garden. We met our host as we were wandering about and we were invited into the house to see the changes they were making. In his spare time, Mr Woolley likes to sculpt in bronze – indeed, some of his work was on display at last summer’s art exhibition! We made our exit through a splendid cast iron gate emblazoned with the name WOOLLEY!! It was a lovely end to the day. We must have stayed until 10.00pm and the sun was still warm. Sunday 29 July – Meg Sinclair of Dunbeath Heritage led us to the Wag of Forss. We drove back one mile up the Causewaymire to the Corr track and walked down the short distance to the Wag. The site is extensive with a broch like feature which has had a wag cut into it. There are other wags and numerous round huts in the complex and around are ancient enclosure walls. Afterwards, a few of us walked around the recently abandoned Corr homestead which has been proposed for renovation in competition with Laidhay and Mary-Anne’s cottage. Wednesday 1 August – An evening walk to Dunnet Links led by Ken Butler. He began by explaining that the blown sand from the beach and dunes had formed a fine turf over hundreds of years and it now extended more than a mile inland. The vegetation was a "machair" similar to that of the Western Isles but was generally more mature because it is not ploughed and the grazing regime is strictly specified by the regulator SNH. The dry hummocks were occupied by Scottish primrose and Mountain Everlasting, the damp hollows by Bogbean and sedges and rushes, while the middle ground had orchids such as the Northern Marsh Orchid, the Early Marsh Orchid, the Frog Orchid, the Twayblade and the Fragrant Orchid. The scarce Baltic Rush is all over the area, representing one of the largest populations of the plant in Britain. The members spent the evening exploring these different habitats. Sunday 19 August – A walk led by Calum MacKenzie – Dorrery to the Hill fort of Cnoc Freiceadain – Six members and friends parked outside Dorrery Lodge and tackled the climb to the top of Cnoc Freiceadain to examine the remains of the hill fort. The weather was kind and we enjoyed our lunches at the top with a superb view of the area. The midges left us alone but the flies were troublesome – the view a panoramic delight. We wandered around on the way down looking for other signs of recent habitation and the ladies had a "nosy" around Dorrery Lodge which still looks uninhabited. Calum was thanked for a lovely day out. Monday 10 September –We were invited to visit Castle Sinclair on a pleasant afternoon. Our host Malcolm Caithness was there to welcome us. Not very much had changed from last year’s visit but Malcolm entertained us with anecdotes from the past and as usual it was a most enjoyable outing. Sunday 30 September – A walk led by Geoff Leet for Archaeology fortnight to Houstry and district – We left Thurso at the early hour of 9.15am meeting with others at Dunbeath harbour. In all, 15 people set off in as few cars as possible on a very pleasant and unusually sunny day to explore, examine and learn about the many archaeological sites in the area. These included a stone circle, a wag and a visit to the sad little graveyard where victims of a cholera epidemic were buried. There are many other sites in this area, but time ran out and it was rather a shame that our packed lunches were eaten in close proximity to yet another wind farm. Our thanks to Geoff for sharing his knowledge. Sunday 28 October – Our walk is usually doomed when we go to see salmon spawning at Braemore and so it came to pass! Very heavy rain again but 3 members walked around the site to check the drainage channel and back along the river. We met the Gamekeeper en route who warned us that the river was too much in spate for spawning to be attempted. From the grass debris forced on to fences, we realized that the river had been much higher recently. We all felt invigorated after our wet walk even if no salmon were seen.